Market in Chiang Mai, Thailand Gathering: Mostly women and children gather a wide range of edible insects in forests and other areas surrounding their village. Gathering insects is mostly done for subsistence uses, but also for sale at local markets. The majority of consumed insects are collected from the wild. Information about the amount of edible insects eaten and how much they contribute to livelihoods is scarce. Because of seasonality, most edible insects harvested provide only food and income for a short period of the year. However, in some regions of Africa, consumption of insects is estimated to fluctuate from 2 to 30 percent of consumption during a year, depending on the availability of insect species. A comparison can be made with summer and winter vegetables. Farming of insects for food and feed, has been identified as a key issue to supply reliable quantities to markets and reduce negative environmental impact from overharvesting. In some countries, such as Thailand, Laos, Vietnam and China, few insect species are “farmed” for cash income especially for the human consumption, but also for feed and medicinal properties. A growing interest for insects as an alternative protein source has also led to the establishment of companies in the Netherlands, Spain, South Africa, United States of America and others,developing techniques for the mass-rearing of insects and producing insect based products. Further Information about mass-rearing can be found trough the joint IAEA-FAO programme, and their manual for insect mass-rearing facilties in the right column. 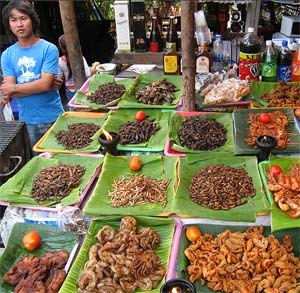 This publication features information about the thriving Thai edible insect industry.